Info "Stop the rolling object by leveling out the hill." Skid Road is one of Dr. Crygor's microgames in WarioWare: Twisted! The name comes from "skid road", which means a run-down urban area with impoverished population. The game's purpose is to stop the rolling object. To do so, the player has to move the blue creature standing on it until it stops. If it stops within time limit, the game is won. 1st level difficulty: The creature is standing on a sponge. 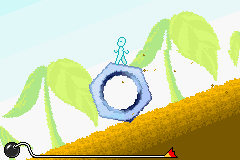 2nd level difficulty: The creature is standing on a metal nut. 3rd level difficulty: The creature is standing on a wheel.